The Houston Astros made baseball history November 1 by winning the World Series. This was the first appearance in the championship for the team, and its first win. For some at Kerr, the win was entirely expected. “They had a lot of support from their fans,” Priya Sinha (9) said, adding that she believe that fan support helped the team win. Coach Mary Pat Bailey, whose husband works for the Astros organization, said they are a talented and motivated team. Hall Monitor Tinsley Jones said the first few innings of Game 7 were tense. “It was two to nothing for a long time,” he said. Some fans felt that it was only right for the Astros to win the World Series because of all Houston has been through in the past few months following Hurricane Harvey. There were many different ways that fans found out the results for the game. 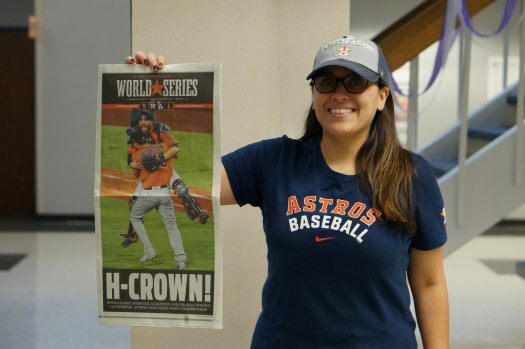 Senior Genesis Gobellan didn’t watch it, but knew right away when the Astros had won it all. In celebration of the Astros winning the World Series, the city has decided to throw a parade in their honor, taking place in the downtown metropolitan area at 2 p.m.